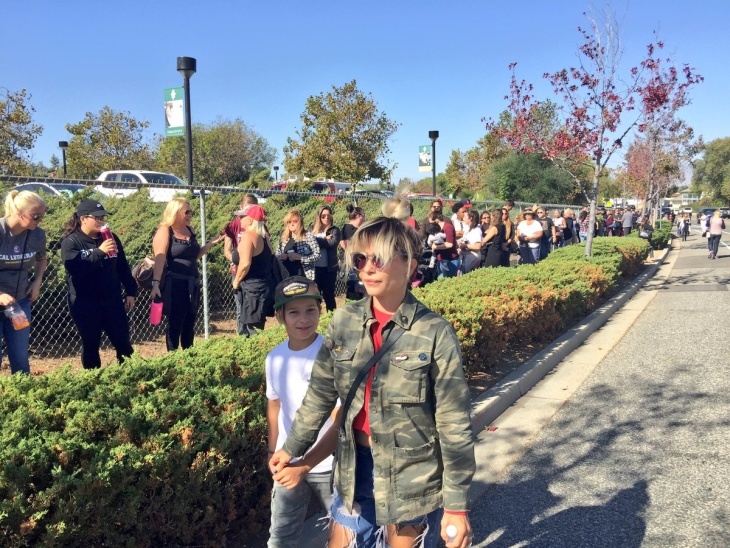 After a tragedy like Wednesday night's mass shooting at the Borderline Bar and Grill in Thousand Oaks, many people are feeling distressed. People also want to help. Here are some resources and advice for how to deal with your own feelings while also helping others. Officials from Los Robles Hospital, which was treating victims from the shooting, said this morning that they are in need of donors. However, the outpouring of support has overwhelmed the blood drives at both La Reina High School and Best Western's Thousand Oaks Inn. To make an appointment to give blood tomorrow (Friday), you can go to Blood4Life.org. However, if you aren't in the area, La Reina High School suggests finding a blood drive or donation center near you. 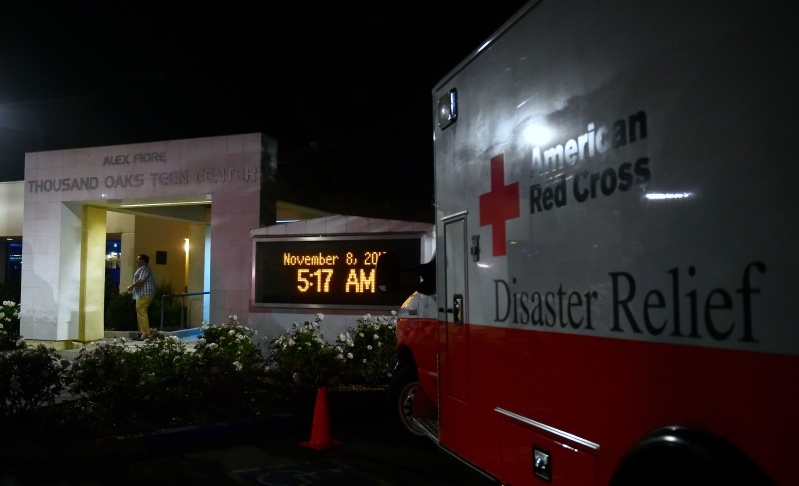 You can find a nearby blood drive through the Red Cross. To give at the La Reina blood drive, you can call 805-543-4290 to make an appointment. Thousand Oaks Transit is also offering free rides to donate blood in the area. You can call 805-375-5473 or 805-375-5467 for more information. We also received a tip that we have debunked — Cedars-Sinai hospital is not treating any victims from the Thousand Oaks shooting, according to their press office, so it is not seeking blood to treat Borderline victims. 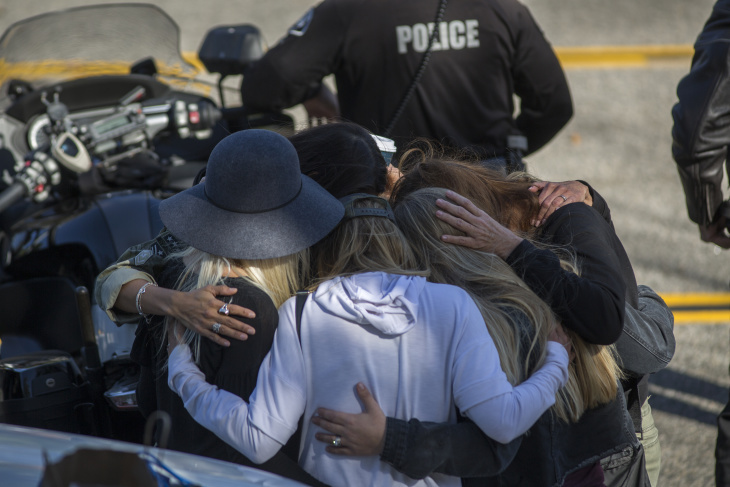 The Westlake Village Rotary Club organized a fund through GoFundMe for victims of the Borderline shooting. The Borderline Bar and Grill's owner is a member of that Rotary Club. "Please respond to this hateful act with your act of love today," the message on the page reads. "This fundraiser is meant to provide relief and financial support to the victims and families of this tragic Thousand Oaks mass shooting. " "Thousand Oaks is more than the community we do business in but rather our brothers, sisters, dads, mommas, friends, family and neighbors," the Borderline Bar and Grill said in its post linking to the fundraiser. After an event like the Thousand Oaks mass shooting, people may have feelings of fear, anxiety, grief, and helplessness, according to the federal government. The director of the National Center for School Crisis and Bereavement, Dr. David Schonfeld, spoke with KPCC's Take Two. This disaster can affect those beyond the people who were directly impacted. "We often go through our day with certain assumptions that allow us to get up and go through our day without feeling overwhelmed," Schonfeld said. "When you hear about it happening someplace else, then you start to feel vulnerable." One thing that can help is joining with others in the community. A vigil for the victims has been scheduled for 6 p.m. at the Fred Kavli Theater at the Thousand Oaks Civic Center. Symptoms after a mass shooting can include overwhelming anxiety, trouble sleeping, and other depression-like symptoms. Other signs of emotional distress include feeling numb, feeling like nothing matters, feeling helpless or hopeless, worrying a lot of the time, feeling guilty but not sure why, feeling like you have to keep busy, and excessive smoking, drinking, or drug use. Self-care. They suggest monitoring your physical health needs. You should remember to eat, sleep, exercise, and try to maintain a normal daily routine. "While it may seem counterintuitive to think about taking care of yourself first, you cannot be of service to others if you are unstable." Pay attention to your emotional health. It's normal to feel a wide range of feelings after an event like this. "Know that others are also experiencing emotional reactions and may need your time and patience to put their feelings and thoughts in order." Try to recognize when either you or those around you need support. People can feel stress following an event like this, including due to things they see in the media. Eating, sleeping, energy level, and mood can all be affected. "Watch for regressed behaviors, such as clinging in children and intense emotional reactions, such as anxiety or a strong need for retribution in adults." Avoid overexposing yourself to media. Information is important, but news about shootings and mass deaths can cause acute stress and post traumatic stress symptoms. Limit your exposure — when you need to, take a break. Point people in need to professional counselors. More information on getting post-disaster help is below. Maintain contact with friends and family. They can help to emotionally support you at this time. Focus on your strength base. Continue your practices that you have found give you emotional relief. "Remind yourself of people and events which are meaningful and comforting." Talk to others as needed. Ask for help if you're having trouble recovering, or if everyday tasks seem difficult to manage. Help others or do something productive. They suggested finding ways in your community to help those who have been affected or have other needs. "Helping someone else often has the benefit of making you feel better, too." Remember that grief is a long process. You'll need time to experience your feelings and to recover. Some may need to stay home, while others will get back to their daily routines. You should expect to experience ups and downs. Disaster Distress Helpline: The federal government runs a helpline for those coping in the aftermath of a disaster. They note that this mass shooting could lead to feelings of fear, anxiety, and grief. You can call 1-800-985-5990, text "TalkWithUs" to 66746, or visit DisasterDistress.samhsa.gov to be connected with a trained crisis counselor. They are available 24 hours a day, and can provide crisis counseling for those in emotional distress related to a disaster, information on how to recognize distress and its effects, provide tips for healthy copy, and offer referrals to local crisis call centers for follow-up care. There is help available for both English- and Spanish-speakers, as well as interpretation for more than 100 other languages. There is also a local helpline for those in Ventura County — you can call the Ventura County Crisis Team at 866-998-2243. People whose lives were in jeopardy or who had people they cared about who were in jeopardy can be affected in many ways, including being hyper vigilant, irritable, or startling easy as they remain on edge, looking for threats, Schonfeld said. "A lot of individuals will also have guilt feelings — whether they have some sense of responsibility about how they contributed, or what they failed to do at the time," Schonfeld said. "People in these situations, they tend to feel guilty, as opposed to recognizing that they had no role to play in it." The most important thing after a disaster like this is for people to get to safety — but Schonfeld said it's also important for those people to feel safe. Their basic needs also need to be provided for. "Individuals often flee the scene, and they leave things behind," Schonfeld said. After that, they need to be reunited with people and things that bring them comfort. "Since there were a lot of college students there, that can be a challenge," Schonfeld said. "For kids who are new to a college campus, they may not yet have a large number of friends. But they're also separated from their families, from the places that brought them comfort, from the individuals who provided them support at times of need in the past. And they're often not in very private environments. Even the bathrooms aren't private, and their bedroom isn't private." For those looking for information on family members or friends, Ventura County has a joint information hotline at 805-465-6650. A Family Assistance Center is located at the Thousand Oaks Teen Center, 1375 East Janss Road, Thousand Oaks. Representatives from the Red Cross and chaplains are on the scene to help. Communities of different faiths often come together in the wake of a disaster in prayer. Take Two looked at this after the 2015 San Bernardino shooting attack. "Prayer is a ritualized way in which people are able to bring those four elements of religion together and really shape meaning and create community when things feel out of control," Loskota said. Loskota responded to people who get upset when prayer is suggested following a disaster. She said prayer isn't a "Get Out Of Action Free Card." "The words in the Gospel of Matthew, Jesus says, 'I was hungry and you fed me,' not 'I was hungry and you prayed for me,'" Loskota said. "There's an impulse that is supposed to compel people to action — that they are empowered through their sense of prayer and clarity that comes with it — to do good things in the world and transform the world." She added, "Religion is not treating prayer as magic ... humans still have obligations to transform the world." Rev. Sandy Tice of the First Presbyterian Church in San Bernardino told Take Two that the point of prayer is often misunderstood. "I don't think we pray believing that suddenly the world will be cheery and perfect," Tice said. "Prayer — in my view — is an act of defiance in a situation like this." Conejo Valley Unified School District - There will be counselors available for students and staff. California Lutheran University - resources and services for students and staff are available at the Thousand Oaks CLU campus Sammuelson Chapel. California State University Channel Islands - Students are encouraged to reach out to Counseling and Psychological Services (CAPS) for additional support. CAPS can be reached anytime at 805-437-2088. If you reach the voicemail, select option 2 to access 24/7 phone counseling. Faculty and staff who would like additional support may utilize the Employee Assistance Program by visiting www.liveandworkwell.com or calling (800) 234-5465. Ventura County Naval Base - Fleet and Family Support Center, For anyone affected and needing assistance from the incident in Thousand Oaks, Crisis Counselors will be available at Building 1169, the Fleet and Family Service Center, on Port Hueneme during normal working hours. People can either walk in, or call the front desk at (805) 982-5037 and make an appointment.